An engineering pioneer brings a unique perspective to the Empire State’s infrastructure needs. McLaren Engineering Group provided design and engineering services to the Township of Weehawken, New Jersey, for a new $3.1-million recreational pier located directly opposite the Empire State Building on the Hudson River. Malcolm McLaren is founder, president and CEO of McLaren Engineering Group, whose portfolio of more than 14,000 projects over 41 years has included landmark infrastructure projects in New York. Known for professionalizing the job of engineer divers, the firm's clients have included the city's ferry system and NY Waterway, which the firm has served via terminal expansions as well as at times of crisis such as Hurricane Sandy and 9/11. Today, his firm is helping clients and partners find new value in abandoned waterfront sites. "We had divers in the water around the World Trade Center and the Battery when it all happened," he says of 9/11, owing to the work his firm does with the ferry system in New York and NY Waterway. "They were witnesses. We were getting calls from them until the phones went out." Private boats and ferries played a crucial role, as they tied off at Battery Park City and evacuated thousands of people. His firm helped the Port Authority of New York and New Jersey establish a temporary ferry landing at Pier A, enabling the system to move 25,000 to 30,000 people a day for about three weeks. Infrastructure investment of various kinds in the Big Apple includes the continuing mixed-use development at Hudson Yards (top); the reopening of the Tappan Zee Bridge (middle) in September; and two new international terminals and a $13-billion expansion at John F. Kennedy International Airport (bottom). That ferry landing went into operation because railways, subways and bridges were shut down after the attack. It's just one of many times McLaren has seen the importance of infrastructure become palpable, rather than its usual "almost subliminal" role. "People don't realize how important it is, but they realize it when they don't have it," he says. 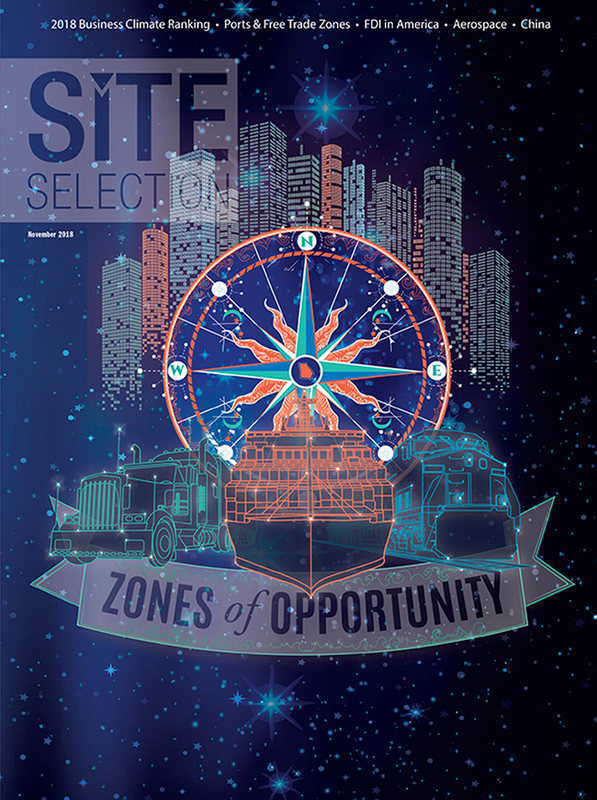 When it comes to site selection for companies or families, the principle is the same: "You're seeing people flee the places that are not kept up, but going to places that are." McLaren's firm recently constructed the "GlassBarge" to help Corning celebrate the 150th anniversary of its HQ move from New York City (where it originated as Brooklyn Flint Glass Company) to Corning, New York, by retracing the journey up the Hudson River and through the Erie Canal system. "I was just up in Buffalo, looking at the Erie Canal history, and the fight about the terminus of Black Rock versus Buffalo," he says of the decision to pick the latter. "These things are real. You connect cities, and investment follows. People say, 'That's a place I can be and should be.' "
McLaren Engineering Group just moved its headquarters from New York to New Jersey, but make no mistake: McLaren is true blue to New York, where his innovation in professional engineer diving had its roots. "I dove in dams built 150 years ago," he says of the early days, "under piers built in the 1920s and 1930s, and saw things that had worked and stayed in place for 50, 80 or 100 years, and things that failed in 20 years, but were hidden under water. I learned about the right and wrong way to build things in the water." Along the way, McLaren saw an economic development opportunity literally lurking under the surface. "I'd dive under the piers that surround Manhattan," he says, "come out and say, 'Why is nobody here? This is valuable real estate.' My conclusion was New York was built facing Central Park, and everything looked inward. The waterfront was where the rats and sailors lived. There used to be an active pier at the end of every street. They became dilapidated and abandoned." Then the water got cleaned up through the Clean Water Act, the areas became more attractive and a ferry system (NY Waterway) was launched by Arthur Imperatore Sr. connecting New York to New Jersey. "People realized this water connection, and all of these abandoned waterfront sites all of a sudden started to become valuable," McLaren says. "We've worked on hundreds of waterfront sites in New York Harbor as they've gone from fallow ground to high rises and parks and restaurants and destinations." Malcolm McLaren virtually invented the occupation of professional engineer diver. The firm today is also helping design terminals for NYC Ferry's expanding service. The next chapter in the region's infrastructure will link Erie Canal-era transport concepts with today's needs. The Port Authority and New York City Economic Development Corporation (NYCEDC) this fall announced the creation of the North Atlantic Marine Highway Alliance, which will seek to foster the use of barge services from Maine to Maryland and to offset the use of trucks and supplement rail cargo to and from the Port of New York and New Jersey. "In partnership with other members of the North Atlantic Marine Highway Alliance," said Patchett, "we can develop a sustainable regional barge network that will support a 21st century economy." Something That Works in Albany? Sometimes a waterway is an obstacle instead of a conduit, however. That's what has prompted yet another unique project that came about on a lark. "One of our guys took the train from New York City to Albany," McLaren says, though the actual station is across the river from the state capital city. "He found out he was in Rensselaer, and said, 'How do I get over there? Why is it so difficult?' A guy in the office mentioned Macau, where we had finished a job working for Steve Wynn where we connected his casino and hotel with a gondola." So his team called Doppelmayr, the global maker of ski lifts, cable cars and gondolas they'd worked with in Macau, to ask in very secretive language if they'd ever worked in a situation where a train station is on one side of a river and everyone wants to be on the other side. "And he said, 'You mean Albany, New York?' " McLaren says with a laugh. Both cities' mayors got on board quickly, but getting the project on the public works roll is more complicated. So McLaren's team took the project private. "That comes with its own perils," he says, but we have some very good partnerships with the city, county and CDTA [Capital District Transit Authority]. They all see this as having a benefit, and are helping us through it. We’ve actually had some original naysayers change their mind and say, 'Maybe it’s not such a bad idea.' "
The project is now at the permitting stage. "The idea is this will do a lot for downtown Rensselaer and downtown Albany," says McLaren. "Our project is budgeted at $25 million, and it’s a mile of infrastructure. Where else can you get a mile of infrastructure for $25 million? That buys a quarter of a bridge or a couple feet of a road."